Plus, I was in Ikea and found plain cork placemats and thought, "I can put a stencil on that!" Color me pleased because I centered it then measured and it was centered. 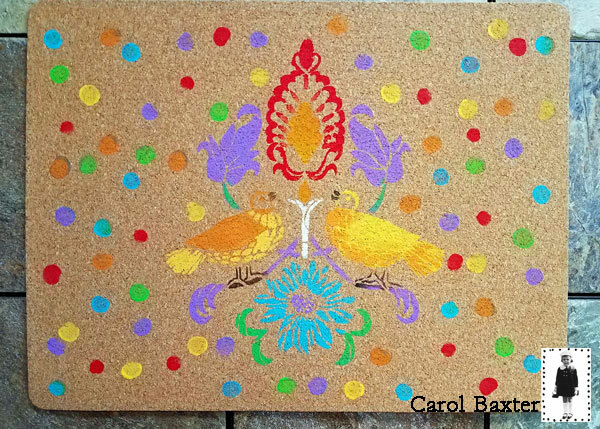 I used the large stencil from Mary Beth Shaw's Private collection 16.3 for StencilClub. Not much layering here except on the birds. Just made 'em opposite colors and on 's beak a bit more open (chatty!). I think this would be a fun project to do with the kiddos if you've got 'em! Doing the same thing is boring so I made 4 different placemats I can use to suit my... oh wait, there's elk outside my window... mood. Let's paint some flowers the elk cannot eat! I used the small stencil from Jennifer Evans' Seredipity Florals for StencilClub. How about an abstract placemat? Just like the flowered one: Flip, align, add paint. Enter bonus stencil from August 2017 StencilClub. Yup! You could keep making words but seriously folks, fun break-time was over for me. I like the one with the partridges the best, particularly if I was going to make sets of placemats as a gift. The flower one was pretty zen to paint. 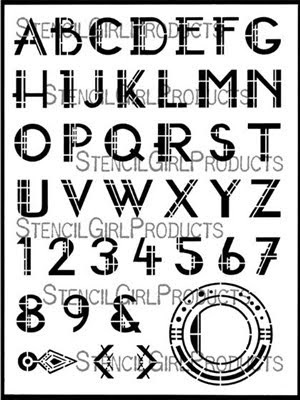 You need to join StencilClub in order to purchase past StencilClub sets. Need a new favorite stencil? I gotta say, I am quite enamored with Gwen Lafleur's Art Deco Alphabet stencil. I know that is going to become one of my faves fast. Let's just stencil through dinner, eh? Cool project! They would make great personal gifts. Carol I love this idea! So fun!